The dialogue between Moldova and Hungary is on the rise and offers the opportunity to develop bilateral economic, social and cultural projects. 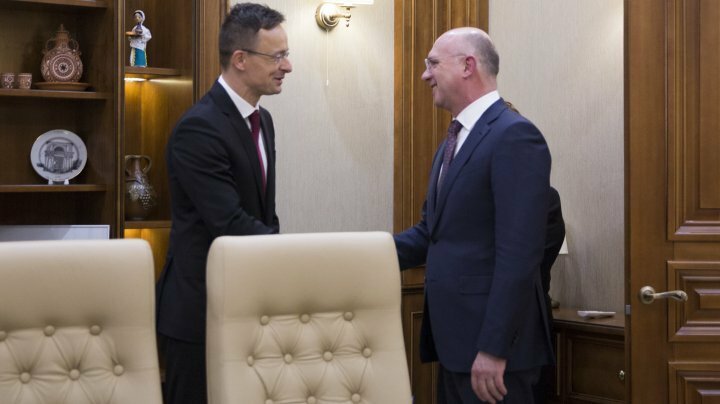 Prime Minister Pavel Filip met with the Minister of Foreign Affairs and Trade of Hungary, Péter Szijjártó. The prime minister appreciated the intention of the Hungarian bank OTP to acquire the majority stake of a Moldovan bank. "The arrival of the Hungarian bank OTP on the Moldovan market is another proof that we managed to stabilize the banking sector in our country. It's motive to be satisfied personally because when I came to power, it was banking crisis. Nowadays more and more investors are coming to this industry", said Pavel Filip. Hungary has also opened a credit line worth 62 million euros for lending to Moldovan and Hungarian companies that develop joint ventures. "We welcome the lending initiative of the companies in our countries. We want as many Hungarian investors as possible in the Republic of Moldova," said Pavel Filip. Officials agreed that the joint intergovernmental commission for commercial-economic collaboration will meet in May for the further development of co-operation between countries in May. This is a good platform for discussion. The prime minister also thanked Hungary for supporting the European agenda of our country. Pavel Filip and Péter Szijjártó also exchanged views on the February 24th parliamentary elections in Moldova. The prime minister said that our primary goal is to organize free and transparent elections according to international standards. Pavel Filip specified that the authorities want as many observers as possible and a fair and objective appreciation of the electoral ballot. Attention! PNI changes parking regulation. What's news? How Anti-corruption Officers rejoice Easter after work? You've ever been to Moldova? Easter is a perfect time to do it!